But that evening of awesomeness almost didn’t happen. You see, truth be told, I had actually completely forgotten about my birthday– it happens almost every year. If it wasn’t for my lovely bud at work who reminded me the week before, it would’ve probably only dawned on me the day before, or possibly on the morning as hubby brings in the birthday breakfast tray. Thus, rendering any possibility of making dinner plans with our buds null and void. Because Lord knows, once you’re a parent, it takes weeks, sometimes months, of architecting a get-together with friends who are also parents. Doubley so, when you’re trying to make a break for it at night…a time when very few capable babysitters are available. But by some small miracle, on such short notice, (almost) everyone was available, and game. (Which parent isn’t game for a lil’ bit of adult time so now and again?) So, with everyone’s babysitters secured, and only four days to go, the hunt for an awesome spot that would make the effort of securing of babysitters, worth everyone’s while, was on! 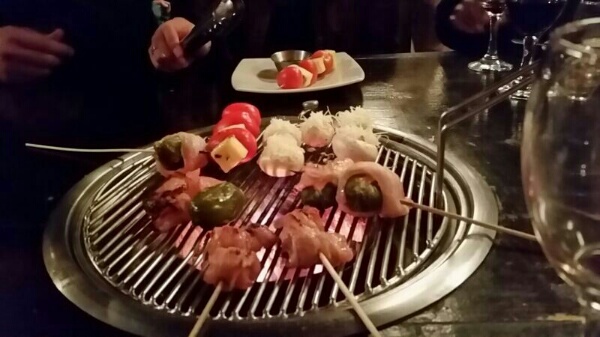 I then remembered a cool place that truly piqued my curiosity when I accidently stumbled upon it online a few months ago – Galbi! 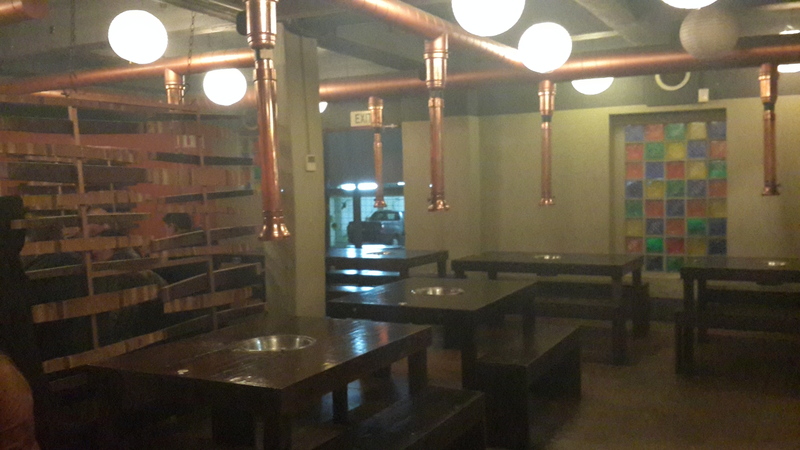 A Korean BBQ joint with a South African twist. 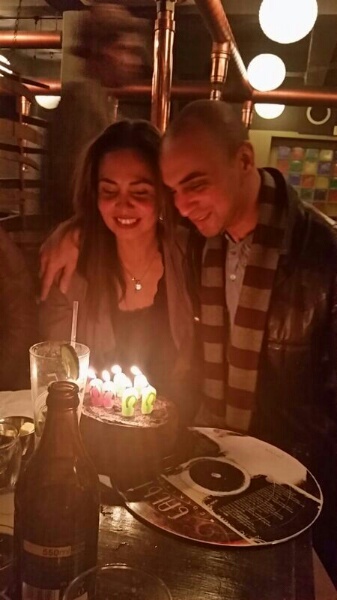 And now, with my birthday, it was the perfect time to tick it off my bucket list. 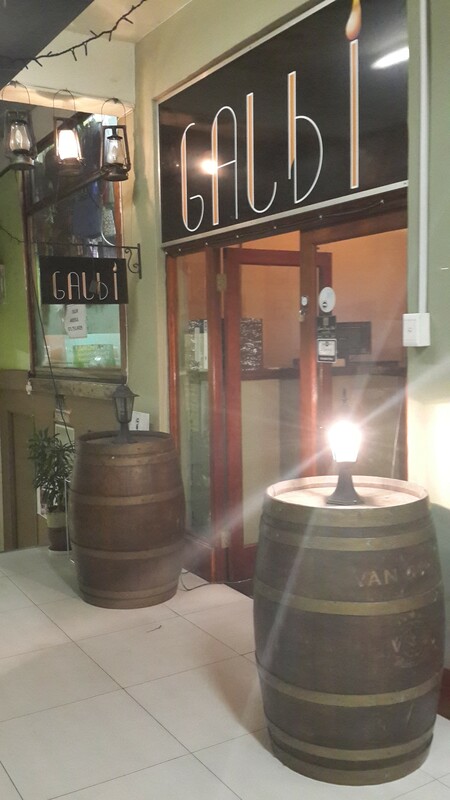 So first things first, whilst Galbi’s address may be 210 Long street, you’ll actually find its entrance in Bloem street. Its tucked away in a little narrow alley, and it might be a little creepy at first. Especially since, in order to save time and to save me from the icy weather, hubby dropped me right at the entrance and drove off to park the car. There’s me. On heels. Teetering my way down the dark alley alone, hoping my Kenpo skills of years gone by are still part of my muscle memory. 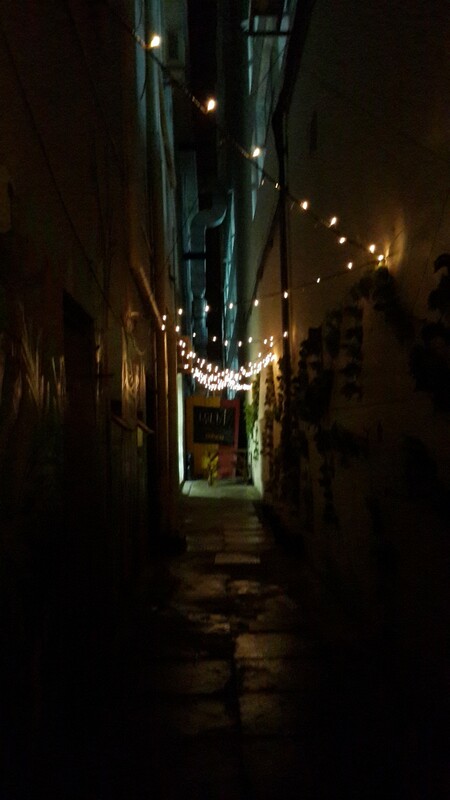 Here’s that fFairy light- lit alley I was talking about. Paranoia aside though, the fairy lights that lit your way like bread crumbs, were actually quite pretty in retrospect. 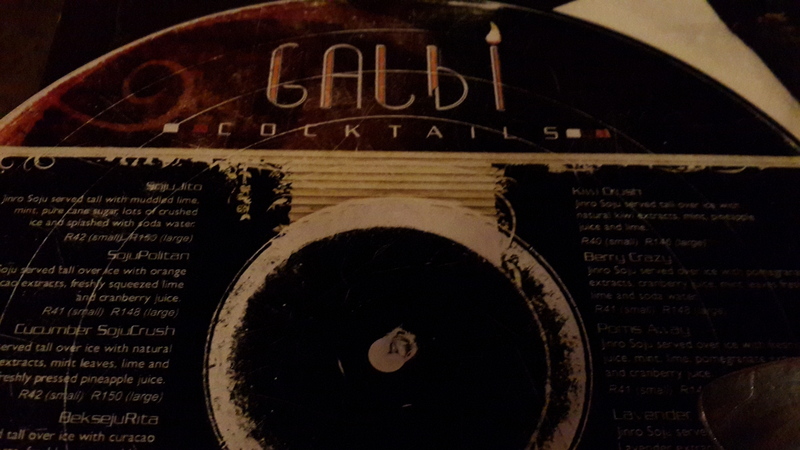 Once at the end of the alley turn left, and you shall immediately see Galbi’s entrance to your right. Now still, you may think its quite dodge, but don’t get all judgey just yet. Push on forward. As you enter you will be greeted with a ceiling full of Asian style paper lanterns,but more striking though would be the funky and intricate copper chimney pipes they got going on. Hot stuff: Each table is kitted out with this little puppy which is slap-bang in the centre of the table. Each table is kitted out with one of these babies! Right in the centre of each table, perfectly capturing the social vibe of everyone huddling around a braai, while marrying it with the ease and “luxury” of a restaurant. 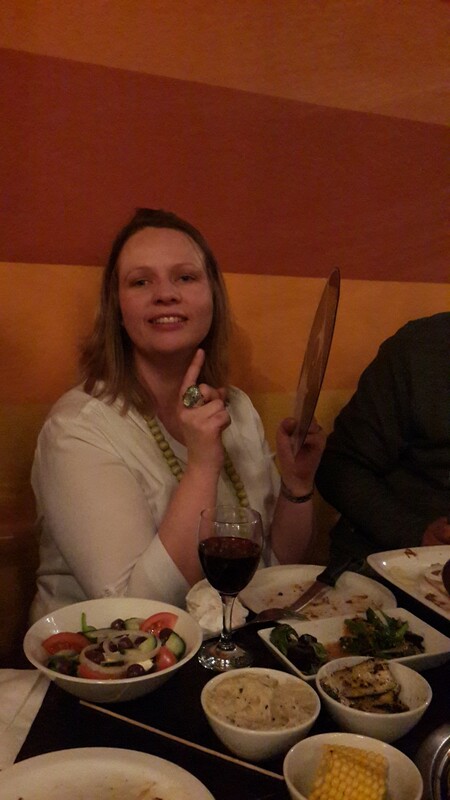 Our friend Liz was feeling naughty that night, and pre-ordered a couple of these Korean wine taster (R40)trays. 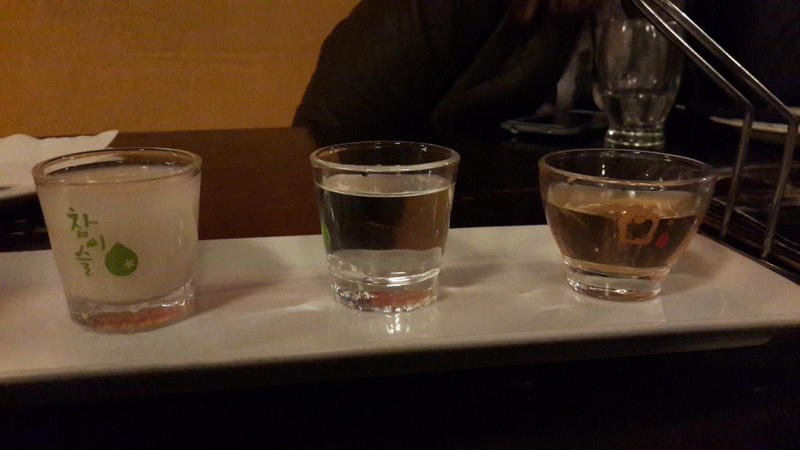 It was fun to try, but in all honesty not all of them were really my cup of tea. The only one I was really all to happy to finish was the Bek Se Ju. Apparently, you will live to 100 if you drink it…Bottoms up,baby! Thereafter, our friendly waitron pitched up with mini tongs for everyone and a pot of fresh hot coals, and filled up our “braai”. The menu is pretty diverse, so if like me, you’re not too sure what you should go with, there are set menus that help. We went with the safari set menu(R250). Its got ostrich, kudu, warthog and zebra sirloin. Each with its own marinade. Gotta say though, I may not have thought my menu selection through all too well, because when it came to tucking into my zebra-ware, I hit a bit of a mental stumbling block. But other than that, I was smacking my lips all night long. And if the mains were not enough to rave about, great-balls-of-fire, you need to sample their sides!! Im talking about the garlic mash, their sweet potato fries,the err-mer-gerd roasted butternut, with maple syrup and cinnamon. The corn, and even the salad were top notch – and Im not a “salad-person”. 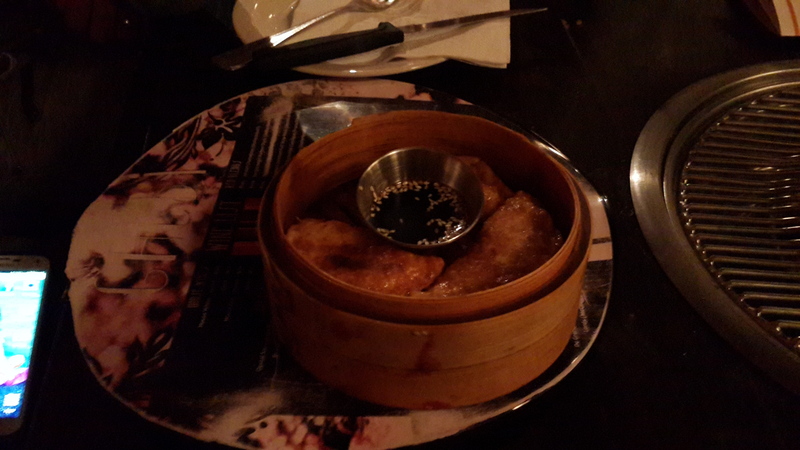 Basically, every side dish we had – and there were a lot– had us coming back for more. 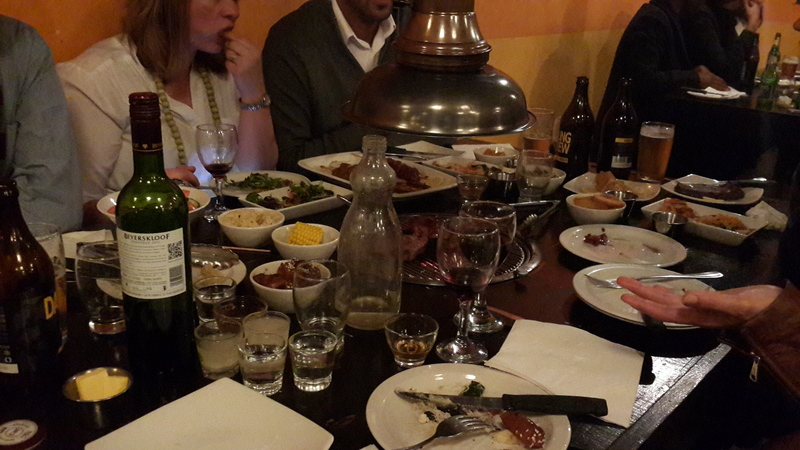 What’s nice is that everyone is sharing with everyone else at the table, so it really becomes a communal meal. Its cray cray how delicious this sweet potato fries were! The cold refreshing drink: move over lemonade, Cucumber Sojucrush is in the house! Liz and I gave the cocktails menu a whirl, and I gotta say, I was not disappointed! If the cool menu wasnt an indication enough of their drinks menu, let me assure you, you wont be disappointed. 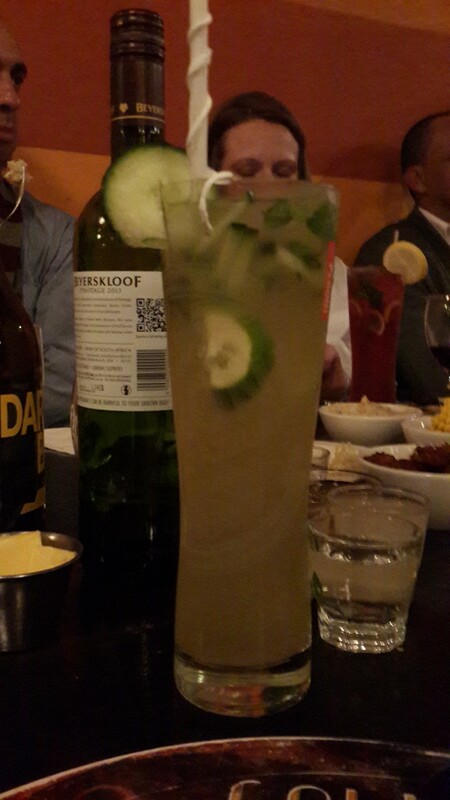 I had the cucumber sojucrush(R42), and it was so refreshing! Liz, too was pretty pleased with her choice. Liz’s very scientific way of selecting her cocktail. It works well. Price-wise, I think that they are generally pretty freakin’ decent. Appertizers starting at R17, with most expensive being R48. And set menus starting at R230, and various well-priced al la carte dishes to pick from instead, there should be something to suit everyone’s pocket and pallette! Get the fire extinguishers ready! Make a wish! Felt like a kid and so loved this night. I got sung to THREE times that day! The fact that hubby had given the cake a good toss up in his haste to get from car to restaurant, he decided that it was HIS version of chocolate upside down cake. 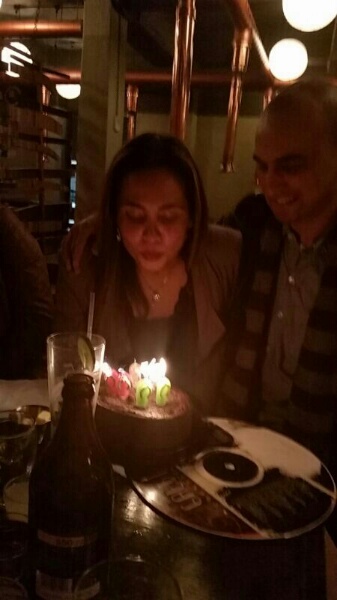 It still tasted good, and I still got to blow out my candles and get thoroughly birthday smooched by my hubby. So I was still a very happy little fish. Lucky girl: Happy birthday, me!! But I think their dessert menu sounds pretty nom-nom and definitely deserves a revisit from us. 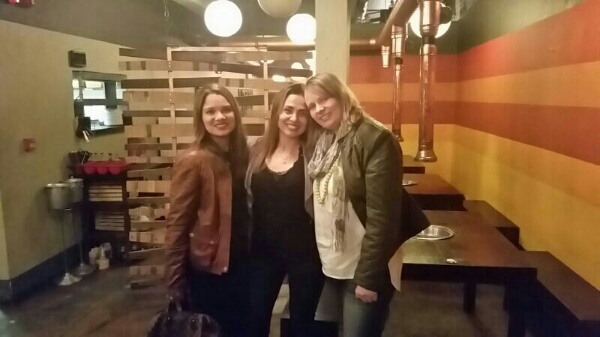 In fact, we all agreed that the evening was loads of fun, and would love to visit again. Gotta love this: No need to feel the fool if the waiter didnt notice you crazily flailing your arms for service. 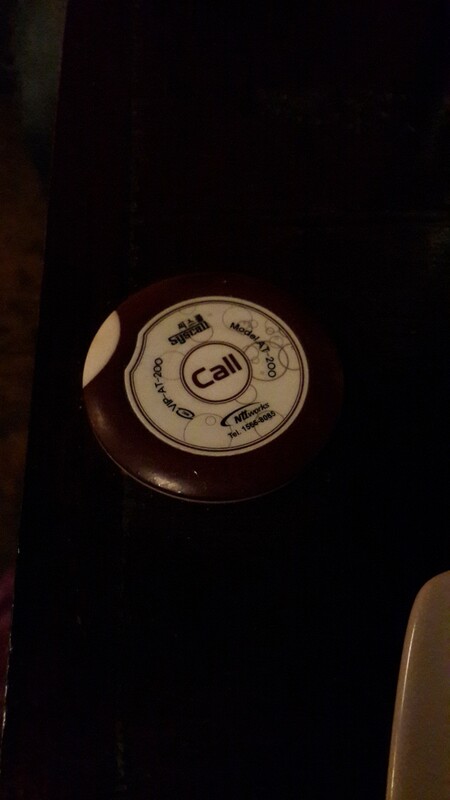 Simply press the buzzer and your waitron is soon to appear. The closest you’ll get to a genie in a lamp. Lurrrrv their funky cocktail menus presented on vinyl. This was a really fun dinner experience, not only great for groups, but also perfect for mom and dad to break away from the usual romantic dinners. 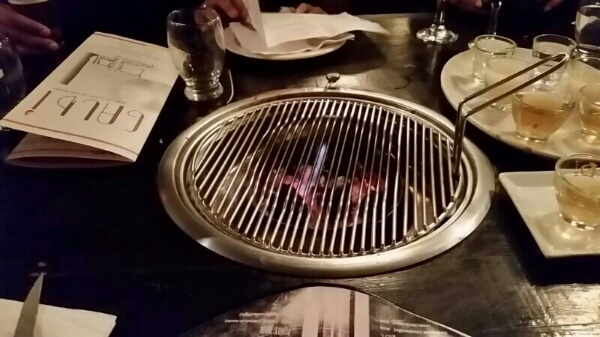 I also think that Galbi definitely belongs on the top list of winter restaurants with fireplaces in Cape Town! 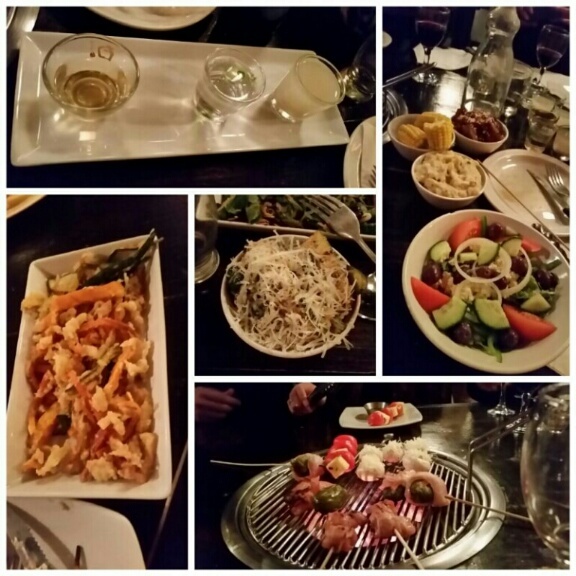 But one things for sure the entire experience from ambience, to food, drink and service is thoroughly enjoyable! And Im totally vibing with their moto of “Braai with caution… Eat with abandon!” .Awesome, innit? « Link between breastfeeding and tooth decay? 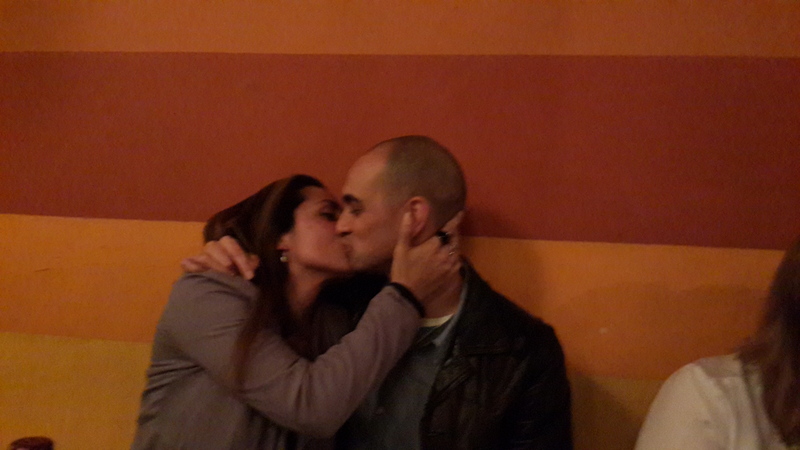 Had such a lovely evening…lovely place.